Zion Market Research has published a new report titled “Compression Garments and Stockings Market by Product Type (Compression Garments and Compression Stockings), Applications and End-User: Global Industry Perspective, Comprehensive Analysis, and Forecast, 2016 - 2022”. 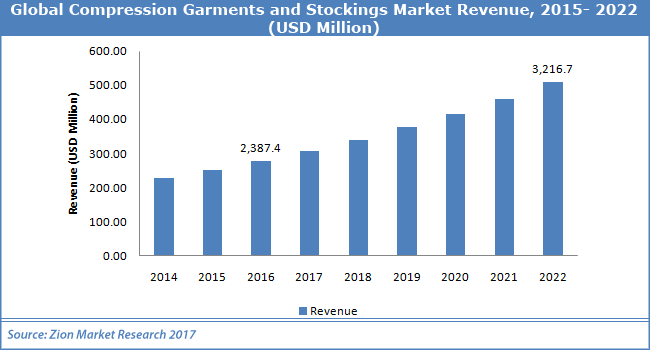 According to the report, Global Compression Garments and Stockings Market was valued at approximately USD 2,387.4 million in 2016 and is expected to generate revenue of around USD 3,216.7 million by end of 2022, growing at a CAGR of around 5.1% between 2017 and 2022. Compression garments are skintight apparels, which stimulate blood circulation and stabilize muscles by exerting pressure on specific parts of the body. Compression apparel helps to improve stamina & body balance and control the body temperature. Whereas compression stockings are elastic hosiery garments applied to a lower limb to achieve graduated compression. They are used for management of venous hypertension, lymphedema, and venous ulcers to reduce edema and aid return of venous blood to the heart. Presently more than 2,50,000 people are suffering from this disease in U.K. The global population of the affected people is swelling every day. Moreover, fitness is the buzzword of the modern society and the global citizens are extremely conscious about their physical and mental fitness. The enhanced awareness levels amongst denizens are creating a major and robust platform for compression garments and stockings market. This market is directly attached to the development and growth of the healthcare industry all over. The rise of the diseases like varicose veins and lymphedema and overall growth of the healthcare industry, a massive global aging population which is easily affected by age-related muscular problems and the steady rise of the fitness and sports industry are some of the drivers which are pulling up the potentiality of the compression garments and stockings market globally. The entire manufacturing market of compression garments is concentrated in Canada and Australia and the supply of clothes and an overall positive scene of the textile market is fuelling the growth of the compression garments and stockings market. The demand for compression garments has increased as athletes are preferring them to avoid any kind of possible injury during an event. The producers are constantly innovating with the materials and revamping styles to woo more consumers. The compression garments and stockings market are extremely prosperous because of the constant modernization drive happening in the sports, fitness and healthcare sector. The compression garments and stockings market are segmented on the basis of product type into compression garments and compression stockings. Compression garments segment is expected to grow at fastest rate in the global market over the forecast period. Hospitals, ASC’s, clinics, online sales and other healthcare facilities are key end-users of the global compression garments and stockings market. The hospital's segment dominated the market in terms of revenue in 2016. North America, Europe, Asia-Pacific, Latin America and Middle East & Africa are key regional segments of global compression garments and stockings market. North America is anticipated to remain the leading region over the forecast period. The U.S. market is expected to grow at the highest CAGR mainly due to immense per capita health expenditures, and significant investments in R&D for effective treatment alternatives. Asia Pacific is expected to be the fastest growing region in compression garments and stockings market during the forecast period. Moreover, the Middle East and Africa and Latin America are also expected to show considerable growth for this market owing to the increased burden of diseases. Some of the key players in compression garments and stockings market include 2XU Pty. Ltd, 3M, BSN Medical, Leonisa, Inc., Medical Z, medi GmbH & Co KG, Nouvelle, Inc., Santemol Group Medical. Companies are involved in collaboration agreements for R&D to exploit maximum potential.